The house is now dressed for Christmas, the only time of the year it looks remotely respectable - for a few days at least. So, while the tree is showing no signs of fatigue, the fairy lights are still working, the door wreath is fresh, candles arranged on every available surface and my over-mantle arrangements are at their peak, I see a three-day window in which I can entertain some friends. Plans for a dinner party are afoot. The menu is planned with considerable thought being invested in the dessert. I want to stay away from traditional Christmassy fare. I have just completed the marathon Christmas baking session, where I have been submerged in brandy, spices and dried fruit for weeks, consequently I decide that it’s time for chocolate. And so I juggle ideas, finally arriving at these two decadent desserts. I bought the edible rose petals for the jellies from Blásta Wholefoods in Dungarvan, and health food shops may be the best place to find them. This pretty and delicate dessert takes a little time and patience, as you need to wait for the jelly to set. It’s a very simple recipe, with outstanding results in terms of flavour and presentation. The white chocolate mousse recipe was given to me by Garrett Byrne of Campagne restaurant in Kilkenny, just as I was about to lose faith in the workability of white chocolate. I have made this dessert for large parties, when I served it in little votive glasses, or you could serve it in martini glasses. Makes six. First, make the jelly. Soak the gelatine leaves in a bowl of lukewarm water until they are soft (this should take about five minutes). Drain the water off the gelatine leaves and return them to the bowl. Dissolve the sugar in the water over a gentle heat. Add the rose water, food colouring and citric acid and heat to simmering point. Pour the hot liquid over the gelatine and stir until the gelatine is dissolved. Pour the mixture into a jug. Divide half the jelly between six glasses and refrigerate until set (this should take about an hour). When set, sprinkle chopped pistachio nuts and rose petals on the jelly. Pour the remainder of the jelly on top. If the remaining jelly has set, reheat it gently to a pouring consistency. Return the jellies to the fridge and allow to set overnight. To make the white chocolate mousse,melt the chocolate in a bowl over a saucepan of simmering water. Melt the butter and add this to the melted white chocolate. Allow this to cool a little, then fold the chocolate into the whipped cream. If you add the chocolate to the cream while it is still hot, the cream will split. Chill the mixture for an hour or so. When you want to serve dessert, pipe the white chocolate mousse over the Turkish Delight jelly. Sprinkle rose petals and crushed pistachios over the top - and a little sprinkle of edible glitter if you have it . This is the nicest tart I have ever made. The recipe came back from New Zealand, courtesy of my chef and kitchen companion, Roisin. The pastry base has a light and crumbly texture, is remarkably easy to work with, but must be chilled before rolling out. But it’s the filling that’s the real gem here, with a velvety smooth texture like crème brûlée. Lightly butter a 24 cm (9½ inch) tart tin and put it in the fridge. Put the flour, and icing sugar in a food processor and aerate with a couple of quick on/off pulses. Add the butter and process until the mixture resembles fine breadcrumbs. Add the egg yolk and water (if necessary) and process until the pastry just draws together. Pre-heat an oven to 190 degrees/gas 5. Roll out to a round at least five centimetres (two inches) larger than the tin. Wrap the pastry around the rolling pin, lift into place and unroll loosely over the chilled tin. Gently lift and press the pastry into the tin to line, then roll the rolling pin over the top of the tin to trim off the excess pastry. Line the chilled pastry case with baking parchment, fill with baking beans and cook for 10 minutes. Carefully remove the beans and paper and cook for another 10 minutes or a little longer, until a light biscuit brown colour. Turn down the oven temperature to 120 degrees/gas ½. Break the chocolate into small pieces and place in a bowl. Bring the milk, cream and sugar to the boil and pour this over the chocolate and beat in the egg yolks. Pass the mixture through a sieve and pour into the pre-prepared base. Bake for 40-50 minutes, until the tart has set around the outside but still has a slight wobble in the centre. Remove from the oven and allow to cool for at least two hours before cutting and serving. Serve with softly whipped cream. Food cooked and styled by Eunice Power. These delicious buttery spicy buns are a real quick fix for Christmas. They are a huge hit as a gift or just to have at home with a few friends for your elevens’s. 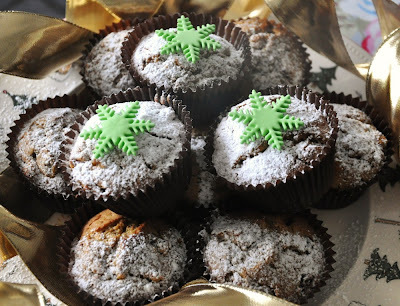 I bake these all the time in December, for coffee mornings, teachers gifts, or just as a thank you to the many people who help me out throughout the year. They are made in minutes and remembered for months! 215g sultanas, soaked in ½ glass of whiskey or brandy overnight. 2. Add the fruit. Mix well. Put mixture in bun cases and bake for 20 minutes. If one considers the dynamic of the traditional party, it is certainly a funny old gathering - a group of guests summoned together either through work or friendship or obligation. Some know each other and some don't, but the one thing they all have in common is that they are known, in some way, by the host. Hence it follows that the successful party is one where the host keeps their guests "moving and meeting". When I host a party, or cater for one, I find that dessert time provides the ideal opportunity to get people moving and meeting. I tend to serve dessert in another room, or from a side table, so guests are invited to get up and move around. Gone are the days of the huge pavlova and big bowls of trifle - all of which look a mess once the first spoon has dug in. Now, it's more about small and sophisticated desserts. Over the years I have gathered up little glasses, crystal sherry goblets, votive light holders, and other suitable vessels which I fill with delicious treats, all of them small so guests can sample more than one. I often include baskets of warm Madeleines, trays of florentines and bowls of little meringues sandwiched together with melting fillings. These are passed throughout the room. In fact I have often been known to grab a passing tray and hand it around as a means of escape from my captor in the corner. Most of these treats can be prepared a day in advance allowing a cool and collected host or hostess to enjoy her own party. These are memorable, light and fluffy, with a gorgeous tangy flavour. Makes six large portions or 12 small ones. Separate the eggs. Put the yolks, zest and juice of the lemons, sugar and passion fruit pulp into a large heatproof bowl. Stand it over a pan of simmering water and whisk until the mixture is thick and creamy - about five minutes. Remove from the heat. Meanwhile soak the gelatine leaves in warm water. When the gelatine is soft, take it out of the water, squeeze off excess water and add to the hot lemon custard. Stir to dissolve completely, and allow to cool. Whisk the cream until it holds its shape and fold it into the cold egg custard. Whisk the egg whites in a clean bowl until soft peaks form. Fold them into the lemon custard gently, until everything is amalgamated. Carefully pour into serving glasses. Chill for at least six hours or overnight. Spoon some passion fruit pulp on top to decorate. These are best made on the day. Makes four large or eight little portions. Break the chocolate into small squares and place in a bowl with the orange juice. Sit the bowl over a pan of simmering water and heat gently, stirring until the chocolate melts and becomes a smooth, glossy mixture. Remove from the heat and allow to cool for 20 minutes. Whisk the cream until it forms soft peaks then, using a metal spoon, fold carefully into the chocolate mixture - make sure you don't beat it as this will knock out all the air bubbles. Divide between glasses and chill for two hours before serving, sprinkled with chopped pistachios and dried rose petals or a few curls of orange zest. These wonderful little meringue clouds will be a hit with young and old. I prefer to make really tiny ones, literally a half teaspoon of the mix, and sandwich two together with sweet chestnut puree. Chestnut puree comes in tins or jars can be found in most good food shops. Preheat an oven to 180 degrees/gas 4. Line the baking trays with parchment paper. Beat the egg whites and salt together until stiff, then add the sugar and vanilla and continue beating until the egg whites hold stiff peaks and form a glossy stiff meringue. Fold in the chocolate and almonds. Drop half teaspoonfulls of the mixture onto the prepared trays. Put in the oven and turn it off. Leave them in the oven overnight with the door closed. To serve, sandwich together with sweet chestnut puree. These can be stored in an airtight container, before sandwiching together, for at least a week. Preheat the oven to 160 degrees/gas 3. Line two baking trays with parchment paper. In a saucepan, melt the butter, cream and sugar together and bring to the boil. Take off the heat and stir in the almonds, orange rind, flour and dried sour cherries or cranberries. Mix well until combined. Place teaspoonfuls of florentine mixture on the baking trays; space them out as they will spread a little when cooking. You will need to work quickly and not allow the mixture to get cool and sticky. Bake in the oven for 10-15 minutes, until they are golden brown. Keep an eye on them after eight minutes. Remove from the oven and allow to cool - they will harden as they cool. Meanwhile, melt 100grams of the chocolate in a heat proof bowl over a pot of simmering water. When the chocolate has melted, remove from the heat and stir in the remaining 50 grams until it has also melted - this is a little trick I picked up and it should give the chocolate a nice shine. Spread a thick coat of chocolate on the flat base of the Florentines and set aside to cool and set. You should get about 20-24 florentines from this recipe. Hide in an airtight container . 1 tbsp orange blossom water - grated rind of a small orange may be substituted. Preheat an oven to 190 degrees/gas 5. Lightly brush the Madeleine moulds with a little melted butter. Beat the eggs and sugar with an electric mixer until thick and pale. Sieve the flour into a bowl and stir in the almonds and salt. Stir the orange blossom water into the melted butter. Using a large metal spoon, incorporate half of the dry ingredients into the egg mixture, then fold in half the butter, and repeat with the remaining dry mix and butter. Allow to rest for half an hour, then spoon the mix into the Madeleine moulds so they are about three-quarters full. Bake for eight to 10 minutes until lightly coloured. Tip out onto a wire rack to cool. These are best eaten warm, but may be stored in an airtight container for a day or two. Madeleines freeze well. Serve with a dusting of icing sugar. Last year I shared my family Christmas cake recipe, a wonderful, rich cake, traditionally decorated with almond paste and royal icing. This year I have decided to go in a different direction. Sugarcraft is now a big business and one that I am not very familiar with. A traditionalist at heart, I had never used roll-out icing until a few days ago. But, inspired by a wedding cake I saw last summer, I decided to go down the route of making spherical cakes and decorating them as Christmas baubles. I bought my tins online from lakeland.com. They came in three sizes - small, medium and large so I bought two of each - my first Christmas purchase. Following on from that was a visit to Brennan's cook shop in Cork which is an Aladdin's cave of all things sugarcraft. It stocks specialist books, edible glitter and lustre sprays, gold dust, piping nozzles, multi-coloured sugar paste and silver, gold and pearl balls - all essentials in the baking cupboard for Christmas. They have a website, cookshop.ie, but it isn't any substitute for a visit to the shop. I experimented with various recipes, and came to the conclusion that a Madeira cake recipe worked best for the baubles, especially one with almonds, which gave the cakes a damper texture and longer life. Once the cakes were cold I trimmed the uneven bits and stuck the two halves together with some butter icing. I then put them in the freezer for 20 minutes so the butter icing would set. When I took them out of the freezer, I trimmed off the excess icing that had oozed out so I had a perfect ball. I then rolled out my block of icing, painted my ball with some warm apricot jam, said a prayer and proceeded to cover my first ball. It took a little time to get it all even. I used a palate knife to gently smooth out any lumps and bumps. A little patience is certainly required here. I then made some royal icing, I used instant royal icing and used some liquid gold colouring to give it a festive colour. The addition of the colouring made the icing a little runny, so I added some icing sugar which made it firmer. I then piped the icing onto the balls; it got easier as I got more confident. I used some pearl balls and other decorations to add bling and then went over them with some lustre spray. The end result is highly impressive, as you will see from the photograph. The piping, along with the spray, covered up any blemishes - the ultimate cosmetic camouflage palette for cakes. I used a chocolate cake recipe for my cake balls, as I knew it would be a hit with my young sons, but feel free to experiment - a good lemon Madeira cake would work well. Just substitute 50g of ground almonds for flour if almonds are not already in the recipe and use regular flour, not self-raising. For the cake, I used the following recipe. This is a great chocolate cake recipe to have in your arsenal - if making for other purposes use two 23cm round sandwich cake tins. It will take about 40 minutes to bake in those. Preheat the oven to 180 degrees/gas 4, and grease your tins. The cake is an all-in-one recipe, so just put all the ingredients in a mixing bowl and beat with a K-beater, if you have an electric mixer, until well combined. Fill the tins almost to the top, the mix will rise a little in cooking. I found that I had to make sure my round tins stayed level in the oven so I nestled them in a bed of baking beans to keep them level. The cakes all took different times to cook. The small ones took 20 minutes, medium took about 30 minutes and the large ones about 45 minutes, you just have to keep an eye on them. To make the butter cream icing place all the ingredient in a mixing bowl and beat with a K-beater until light and fluffy, about seven to 10 minutes. For those who don't like traditional Christmas cake, and don't want to go on the Christmas bauble journey, try this super rich, chocolatey boozy version. My friend and neighbour Anike, a great baker herself, gave me the recipe at least a decade ago and I have been baking it ever since. The cake will last for at least a week, and it's best left for a day before eating to allow the flavours to develop. It's a great party cake, served with creme fraiche. The cake can be made in a 30cm cake tin or a similar size novelty cake tin. I use a Christmas tree shaped tin that is pulled out from the depths of my baking cupboard every Christmas. Preheat the oven to 180 degrees/gas 4. Brush the base and sides of your tin with melted butter, and dust with flour. Beat the egg yolks with the sugar until thick and creamy. Melt the butter with the water in a saucepan over a gentle heat. When it is melted take it off the heat and stir in the chocolate. Keep stirring until the chocolate is melted. Fold the chocolate mixture into the beaten egg yolks and sugar, then fold in the flour and almonds, followed by the soaked sultanas and brandy. Whisk the egg whites in a spotlessly clean bowl until stiff, but not dry. Fold the egg whites into the cake mixture. Pour the mixture into the prepared cake tin. Bake in the oven for 20-25 minutes. Allow to cool in the tin and carefully turn the cake out on to a cooling rack. For the glaze, melt the chocolate and butter in a bowl over a pan of simmering water. When melted, stir until smooth. Allow to cool for 10 minutes then spread evenly over the top of the cake. When the glaze has set, decorate with a Christmassy theme.